In the figure, the dividends of the supernormal growth firm are expected to grow at a 30 percent rate for three years, after which the growth rate is expected to fall to 8 percent, the assumed average for the economy. The value of this firm, like any other, is the present value of its expected future dividends as determined by Equation 5-1. When Dt is growing at a constant rate, we simplified Equation 5-1 to P0 = D1/(rs — g). In the supernormal case, however, the expected growth rate is not a constant—it declines at the end of the period of supernormal growth. nThe concept of life cycles could be broadened to product cycle, which would include both small startup companies and large companies like Procter & Gamble, which periodically introduce new products that give sales and earnings a boost. We should also mention business cycles, which alternately depress and boost sales and profits. The growth rate just after a major new product has been introduced, or just after a firm emerges from the depths of a recession, is likely to be much higher than the "expected long-run average growth rate," which is the proper number for a DCF analysis. 12A negative growth rate indicates a declining company. A mining company whose profits are falling because of a declining ore body is an example. Someone buying such a company would expect its earnings, and consequently its dividends and stock price, to decline each year, and this would lead to capital losses rather than capital gains. Obviously, a declining company's stock price will be relatively low, and its dividend yield must be high enough to offset the expected capital loss and still produce a competitive total return. Students sometimes argue that they would never be willing to buy a stock whose price was expected to decline. However, if the annual dividends are large enough to more than offset the falling stock price, the stock could still provide a good return. Because Equation 5-2 requires a constant growth rate, we obviously cannot use it to value stocks that have nonconstant growth. However, assuming that a company currently enjoying supernormal growth will eventually slow down and become a constant growth stock, we can combine Equations 5-1 and 5-2 to form a new formula, Equation 5-5, for valuing it. First, we assume that the dividend will grow at a nonconstant rate (generally a relatively high rate) for N periods, after which it will grow at a constant rate, g. N is often called the terminal date, or horizon date. 1. Find the PV of the dividends during the period of nonconstant growth. 2. Find the price of the stock at the end of the nonconstant growth period, at which point it has become a constant growth stock, and discount this price back to the present. 3. Add these two components to find the intrinsic value of the stock, P0. 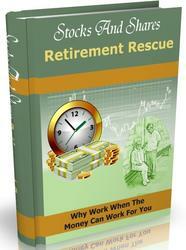 rs = stockholders' required rate of return = 13.4%. This rate is used to discount the cash flows. 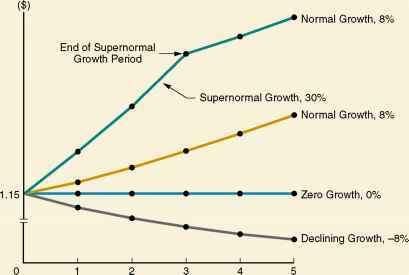 N = years of supernormal growth = 3.
gn = rate of normal, constant growth after the supernormal period = 8%. This rate is also shown on the time line, between Periods 3 and 4. D0 = last dividend the company paid = $1.15. Step 1. Calculate the dividends expected at the end of each year during the supernormal growth period. 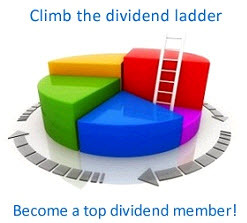 Calculate the first dividend, D1 = D0(1 + gj = $1.15(1.30) = $1.4950. Here gs is the growth rate during the three-year supernormal growth period, 30 percent. Show the $1.4950 on the time line as the cash flow at Time 1. Then, calculate D2 = D1(1 + gj = $1.4950(1.30) = $1.9435, and then D3 = D2(1 + gs) = $1.9435(1.30) = $2.5266. Show these values on the time line as the cash flows at Time 2 and Time 3. Note that D0 is used only to calculate D1. Step 2. The price of the stock is the PV of dividends from Time 1 to infinity, so in theory we could project each future dividend, with the normal growth rate, gn = 8%, used to calculate D4 and subsequent dividends. However, we know that after D3 has been paid, which is at Time 3, the stock becomes a constant growth stock. Therefore, we can use the constant growth formula to find P3, which is the PV of the dividends from Time 4 to infinity as evaluated at Time 3. We show this $50.5310 on the time line as a second cash flow at Time 3. The $50.5310 is a Time 3 cash flow in the sense that the owner of the stock could sell it for $50.5310 at Time 3 and also in the sense that $50.5310 is the present value of the dividend cash flows from Time 4 to infinity. Note that the total cash flow at Time 3 consists of the sum of D3 + P3 = $2.5266 + $50.5310 = $53.0576. Step 3. Now that the cash flows have been placed on the time line, we can discount each cash flow at the required rate of return, rs = 13.4%. We could discount each flow by dividing by (1.134)t, where t = 1 for Time 1, t = 2 for Time 2, and t = 3 for Time 3. This produces the PVs shown to the left below the time line, and the sum of the PVs is the value of the supernormal growth stock, $39.21. With a financial calculator, you can find the PV of the cash flows as shown on the time line with the cash flow (CFLO) register of your calculator. Enter 0 for CF0 because you get no cash flow at Time 0, CF1 = 1.495, CF2 = 1.9435, and CF3 = 2.5266 + 50.531 = 53.0576. Then enter I = 13.4, and press the NPV key to find the value of the stock, $39.21. The valuation process as diagrammed in Figure 5-3 is explained in the steps set forth below the time line. The value of the supernormal growth stock is calculated to be $39.21. Explain how one would find the value of a supernormal growth stock. Explain what is meant by "horizon (terminal) date" and "horizon (terminal) value." How to get P3 in nonconstant growth? How can companies with nonconstant growth be analyzed? How to calculate non constant growth? How to calculate value of stock that have a nonconstant growth rate? What is Nonconstant Growth Rate Stocks? What is terminal value of nonconstant? Is it good for dividends to have a constant rate? 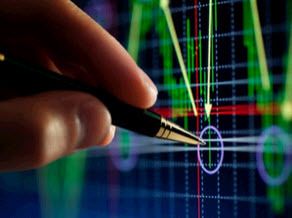 What is the stock price calculator non constant? How to find value of nonconstant growth stock?